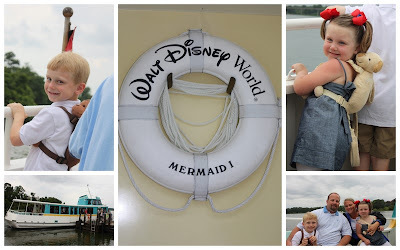 Today (Tuesday) we said good bye to GoGo and Granddaddy and Granny and Pap Pap went to meet cousin Olivia and family at Animal Kingdom and we opted not to endure that pain again so the four of us decided to go back to Magic Kingdom. 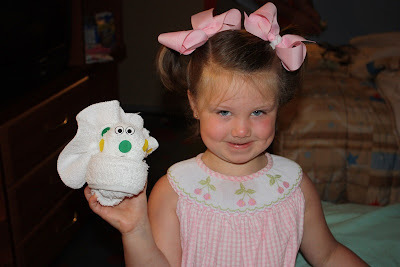 But before we left (b.c we got a later start than normal) the maid came by and made the kids towel animals. Here is Brylee showing off hers! We then headed to the park just in time for a parade! These kids were ALL ABOUT a parade. 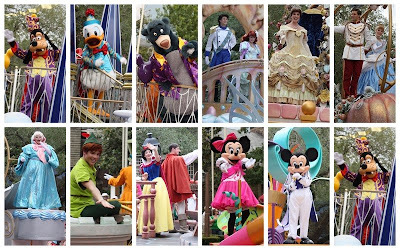 This parade was going on in front of the castle and down main street when we arrived so we of course had to stop and watch! 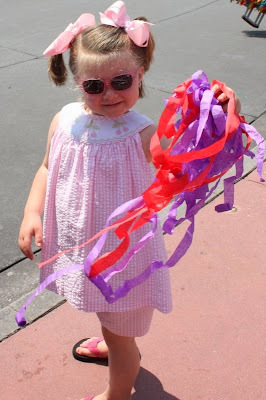 Towards the end of the parade they shoot out paper streams to the crowd and brylee caught some...she was so excited! I could absolutely eat her with a spoon in her sunglasses and piggy tails!!! Ready for Hollywood for sure! 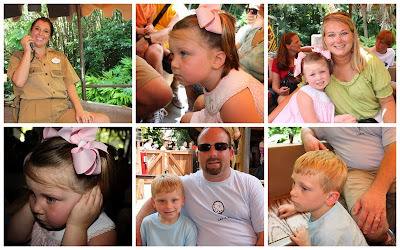 We then went to ride the jungle cruise. Daddy really thought they would enjoy it but not so much. They don't really get the corny jokes but we were able to get some cute pictures while on the boat! 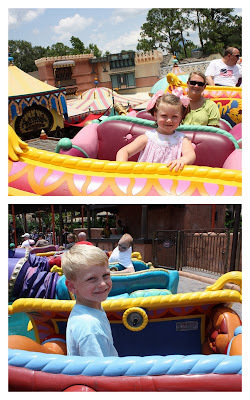 Then we went and ride The Magic Carpet and they enjoyed riding that. They like making them go all the way to the top. 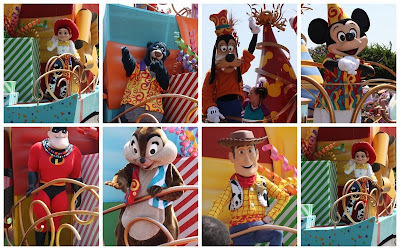 When then grabbed some lunch and then staked out a spot for the afternoon parade... i told you we were all about a parade. This was brylee's favorite. She can sing the song and do the motions we saw it so many times. We then went back and got ready for dinner. 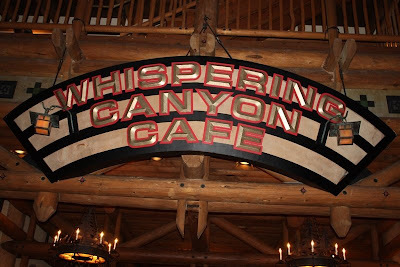 We went to eat at Whispering Canyon. It is located inside the Fort Wilderness lodge. It was recommended to us by our preachers wife who was a resident and season pass holder to disney before she moved her. It was really good and fun! 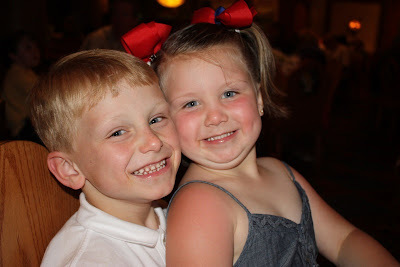 My two cuties at dinner! 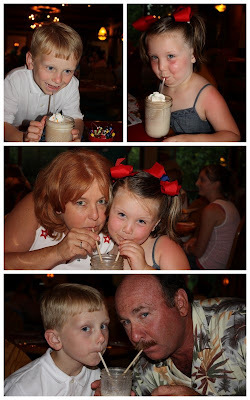 They had an all you can drink milkshake bar. Yummy!!! It was a western style restaurant. The waiters and waitress talked loud and banged their tray holder when they walked and they played jokes on the customers. One of the jokes was when someone in the restaurant ask for ketchup everyone in the restaurant brings them their bottle of ketchup. So naturally the kids could not wait to ask for ketchup. They just grinned when everyone brought them. 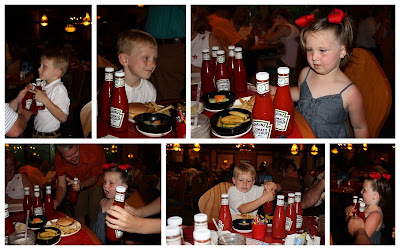 Then when another table needed ketchup they had to take all the bottle to them. It was cute!!! 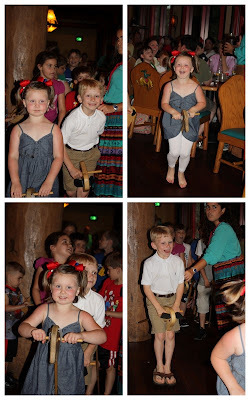 They also had stick horse races during the dinner. All the kids got a stick horse and ran around the circle around the tables. They also sang the hokey poky. There were not any characters and I was thinking they might be disappointed but they were not. They loved the jokes, horse races, and they had a Lincoln log table that they played at too. If you have a boy they will enjoy it. The men will enjoy the food. Daddy and Pap Pap said this was their favorite meal. We enjoyed it! 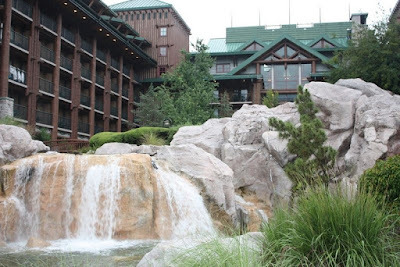 This was the view of the lodge from the back... i thought the waterfall was beautiful! Reminds me of a ski lodge you would see in Colorado! Very pretty! After dinner we rode the boat over to Magic Kingdom to ride some rides and meet Cousin Olivia who the kids were DYING to see and watch the light parade and fireworks... but it started raining and they canceled the parade and fireworks. We also had fast passes to Splash Mountain but due to the rain and lightening they closed the ride so we left and went back to the hotel. We had a great day! Fun times were had by all! It was a two post day b.c i have got to get through with these updates! We are headed to the lake this weekend so I am sure i will have more from that! Plus in the near future all stars and a dance recital! I have enjoyed looking at all of your Disney pics! I wish we were still there! !